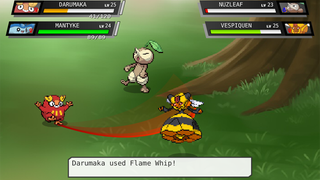 Pokémon Evoas is a fan-made game that aims to change and mix up a few things concerning classic Pokémon gameplay. It is a mostly one-man project by th3sharkk and a a few other contributors, who have just released a 30-minute preview of their project that is playable over here. I really like the art style—it's a lot better than the kind you see in the typical, average-looking fan games made in RPG Maker. Besides that, the story also is a bit different this time: instead of winning badges, you have to reclaim your old Pokémon team. The battle system has been changed as well. They've added tougher, so called infected trainers and a high stakes risk/reward mechanic called brink mode. Pretty cool project, definitely worth checking out. And hopefully it will be finished soon.